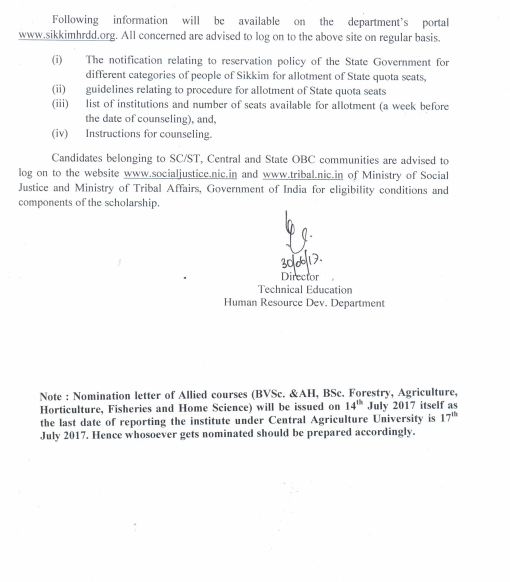 Sikkim NEET Counselling 2018: Human Resource Development Department Government of Sikkim will conduct Sikkim NEET State Quota Counselling 2018. The state quota counselling registration will be started after the NEET UG Result 2018 announcement. 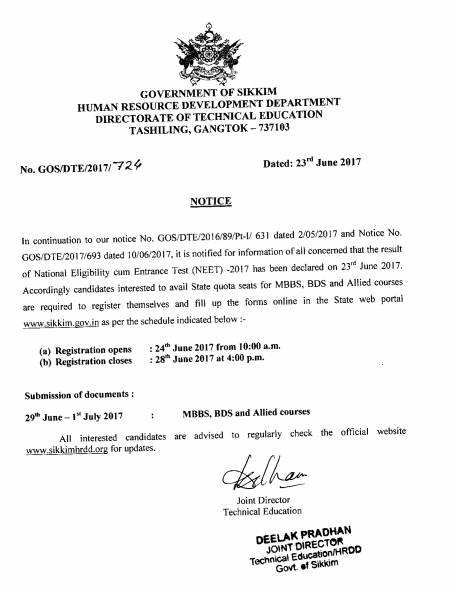 All candidates who have successfully cleared NEET UG exam will be eligible to fill the Sikkim NEET Counselling registration form. The official authority will prepare a state level merit list on the basis of NEET scorecard. All candidates who are listed in the official merit list (available soon) of Sikkim state quota MBBS & BDS counselling 2018 can lock their college choices. Candidates are advised to keep checking this website for more latest updates of NEET Counselling 2018. 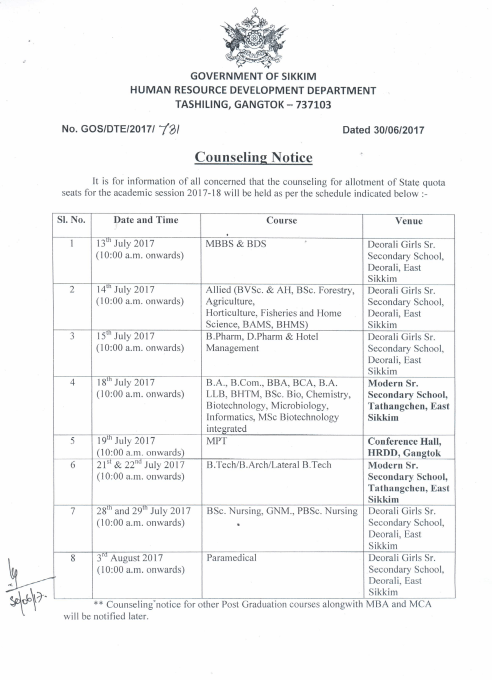 As you know that the counselling mode is offline and it will be conducted in the hall of Deorali Girls Senior Secondary School, Gangtok from 10:00 a.m. onwards. All candidates are suggested to present in the counselling hall latest by 9:45 a.m.
For the academic session 2018-19, Sikkim Manipal University has provided 30% MBBS seats out of their total intake. Of this 30% seats, 20% seats will be on concessional fee and 10% will be on the full basis. The seat matrix for the concessional seats will be drawn as usual along with other available seats. However, for the seats with full course fee seat matrix will be drawn separately duly following the reservation and roster policy of the State Government. Note: All dates have mentioned above are expected based on the previous year’s counseling schedule. 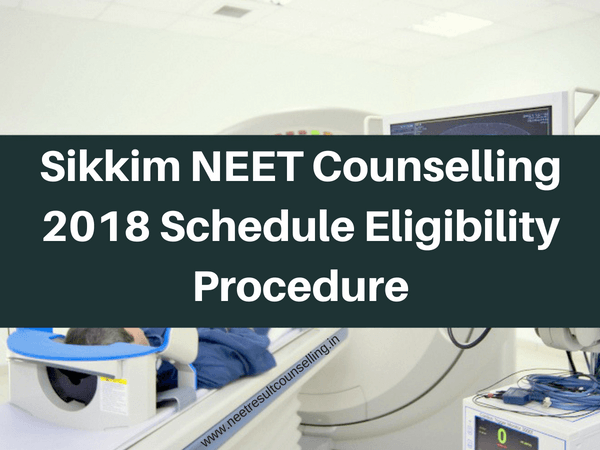 We will publish the final counselling schedule after the NEET 2018 Result announcement. All candidates of Sikkim state are advised to keep their eyes on this page for all new updates. Final Word: All candidates are suggested to keep visiting this page for all latest updates regarding Counselling and seat allotment result. Candidates can follow us on our Facebook Page for more updates. Only if you have a Sikkim domicile or your father /mother is a government employee in Sikkim or hold trade license issued in Sikkim , then you are eligible to apply for Sikkim state quota.